Last week, I saw this advertising all over an older minivan, in need of repairs: “Automobile restoration inside and out”…and the appropriate phone numbers to call. If you’re a social media expert, shouldn’t you be regularly portraying that expertise across a variety of social media? If you’re a copywriter, shouldn’t you prove it by regularly blogging and writing engaging content? If you’re a web designer, shouldn’t your website look great, while reflecting your technical understanding and creative eye? Now, if you’re a coach, how might you best portray that skill to the public? Possessing the necessary tools and skillset. Owning a professional looking, easy-to-navigate website. An engaging message, consistently promoted on the appropriate social media. Surrounding yourself with capable, dependable, and knowledgeable support. To be sure that you’re advertising the right message by consistently “walking the talk”, take a look at my personal Strategic Checklist for Success below. Try it for yourself and see the difference it can make in your own business! Here are a few important items on my checklist. I make it a point to work these into my business ‘maintenance’ routine. Review website regularly for outdated information. Regularly communicate with current list through two newsletters (one geared towards general entrepreneurial tips and the other geared towards Infusionsoft tips). Hire virtual assistants to help with tasks I should not being doing (or that I’m not good at). This one took me years to get to. After all, I was a virtual assistant…I could do my own “stuff”! Review stats: website traffic, opt-ins, unsubscribes, opens and clicks. Regular meetings with specific team members, and the team as a whole. Continually learn about online marketing. Use Infusionsoft as it should be used. I sell, teach, and support clients with Infusionsoft, how could I not be using it myself? You can’t always do everything you know that you should do. That’s just life. 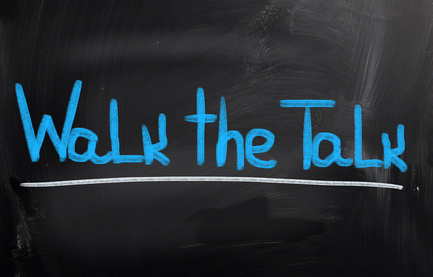 But when it comes to how you do business, ‘walking the talk’ speaks volumes to others about your capability, skill level and just how worthy you are of their investment. You have the opportunity to be your own best (or worst) advertising. So how do you walk the talk in your business? Share with me below.